When your routine takes place both in and out of the water, JBL Endurance Dive headphones are built to keep up. 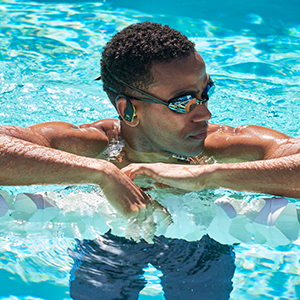 Assured never to hurt or fall out, Dive amplifi es your workout with an IPX7 waterproof rating. Its sleek PowerHook design powers on automatically when you slip it behind your ear, while a secure wireless neckband keeps it in place. Leave your device behind with Dive’s 1 gigabyte memory storage (up to 200 music tracks), accessed with touch controls. And with 8 hours of battery, Dive is ready to hit the pool, track, and gym all in one day. Bluetooth technology enables hands-free calling, allowing you to focus on your workout.